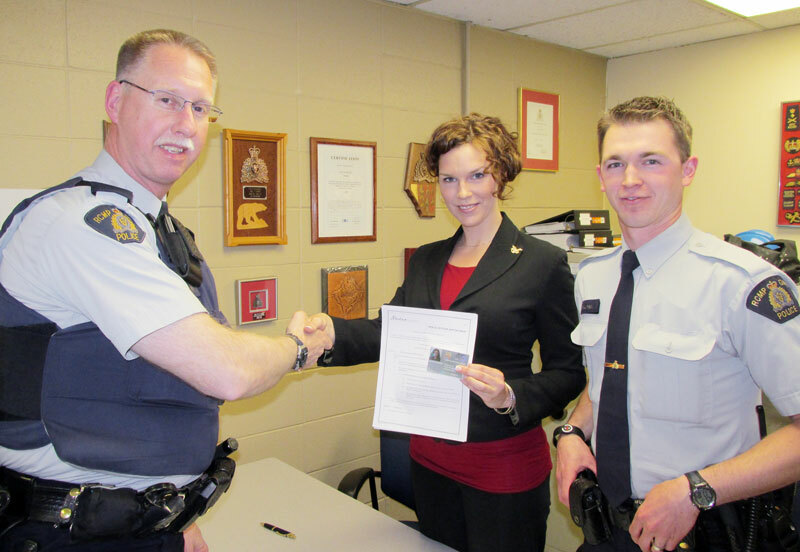 During the afternoon of May 8, 2013 a swearing in ceremony at the Chestermere RCMP Detachment was conducted welcoming Jenn WARD as the most recent Chestermere RCMP Auxiliary Constable. This is a special year with the RCMP auxiliary constable program celebrating its 50th year in existence. In 1963, the RCMP began its Auxiliary Constable Program to enhance community policing and crime prevention initiatives. Today, there are more than 2,000 Auxiliary Constables nation-wide. Some accompany regular members on patrol or assist with special events and crowd control, while others give safety presentations, fingerprint children, co-ordinate neighborhood watches, or perform bike patrols. Whatever the function, they’ve played a significant role in helping the RCMP to meet their mandates. Enlisting in this program is a big commitment. As with regular members of the RCMP, an auxiliary constable must first qualify for the position, and then undergo comprehensive training. They must then volunteer a minimum number of hours per year of their time, although many give much more than that. Many of these men and women already have full-time jobs and families, giving up their holidays and weekends giving special volunteer service to their communities. They receive no benefits, other than the pride gleaned from making a difference in their community. There is a huge value in having auxiliary constable programs throughout Canada. Auxiliary Constable WARD will be joining Auxiliary Constable GUILLOUX as the second of two Chestermere RCMP Detachment auxiliary constables. She has been in the process of becoming an auxiliary constable for well over one year. During this time she was subjected to a strict security screening process and endured a four day basic training course in Edmonton. Jenn lives in Chestermere and brings some impressive life and career skills to this program. When you see either of the auxiliary constables on duty please take a moment to say hello and thank them for serving as a volunteer with your local police service trying to make a positive difference in our community.